When she was younger, Rose’s parents hired an art tutor for her. Unfortunately, since her teacher didn’t know American Sign Language (ASL) and Rose was Deaf, the communication barrier made her artistic outlet frustrating. However, she found her love for creating art again in college. 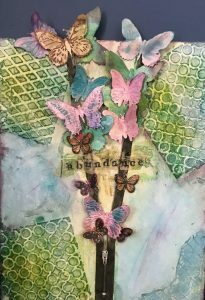 Mixed media and clay are her favorite mediums to create with. Rose advocates for and helps a diverse group of people as the executive director of Deaf World Against Violence Everywhere (DWAVE). Five Deaf women founded the statewide agency, and it is currently Deaf run. The agency advocates for those who experience trauma from violence, and is also on call 24/7 to provide long-term advocacy for the Deaf community. DWAVE also provides support, training, education, therapy, links to resources, and assists in helping other organizations become Deaf friendly. 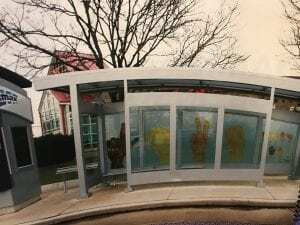 Working at DWAVE, Rose sees the hatred and division that can exist, which is why she chose to paint the word “LOVE” for the CMAX bus stop.